PDP leader Mehbooba Mufti on Wednesday slammed BJP after the party fielded Sadhvi Pragya Thakur against Congress leader Digvijaya Singh for Bhopal Lok Sabha seat. Mehbooba has been leaving no stone unturned to attack the BJP since saffron party walked out from coalition in Jammu and Kashmir. 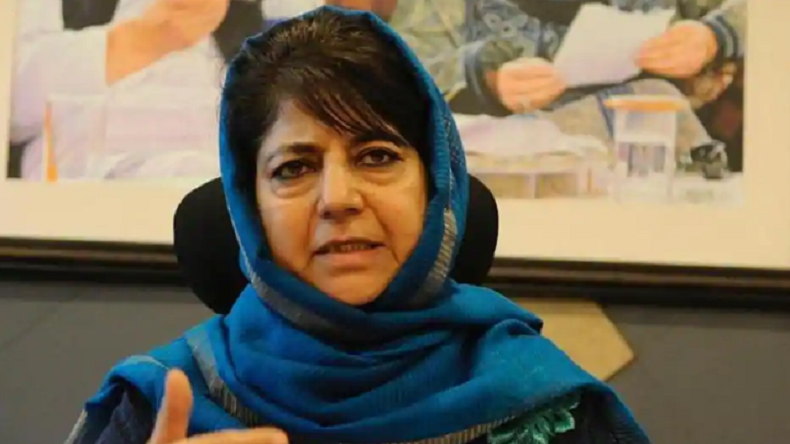 Former Jammu and Kashmir chief minister Mehbooba Mufti on Wednesday slammed BJP after the saffron party fielded Sadhvi Pragya Thakur, an accused in 2008 Malegaon bomb blast case, for Bhopal Lok Sabha constituency. Peoples Democratic Party (PDP) president on her official Twitter handle questioned the ruling BJP government over his candidature. She asked what would happen if her party had fielded a terror accused in elections. The media may have gone berserk after the announcement. Reacting over the Sadhvi’s joining into the saffron party fold, Mehbooba took a jibe over BJP and said that terrorism has no religion when it comes saffron fanatics but all Muslims are otherwise terrorists. Mehbooba Mufti, who is contesting the ongoing Lok Sabha elections 2019 from her home turf Anantnag, has been leaving no stone unturned to attack the BJP. On Wednesday, BJP announced that it has fielded Sadhvi Pragya Singh Thakur, who is facing trial in 2008 Malegaon bomb blast case, against senior Congress leader Digvijaya Singh from Bhopal Lok Sabha constituency in Madhya Pradesh. Sadhvi Pragya formally joined the BJP. Expressing her desire to contest against Digvijaya Singh, Sadhvi Pragya has said she is confident of winning the Bhopal seat and Singh is not a challenge for her because she is a nationalist while the Congress leader spews venom against the nation. The controversial Sadhvi Pragya has also met former Madhya Pradesh chief minister Shivraj Singh Chouhan and other BJP leaders at the party office earlier today. The Hindutva activist Sadhvi Pragya Thakur is currently out on bail in the 2008 Malegaon blast case. Sadhvi belongs from Madhya Pradesh’s Bhind district. She was arrested in 2009 after her name surfaced in connection with the blast case. The BJP sympathiser was jailed for nine years but later she was given a clean chit by the National Investigation Agency (NIA) in 2015. The Madhya Pradesh is slated to go for Lok Sabha 2019 polls in four phases. Sadhvi Pragya is contesting from Bhopal Lok Sabha Constituency against Congress stalwart Digvijaya Singh. In 2014, the seat was claimed by BJP leader Alok Sanjar. Alok had won against Congress candidate P.C. Sharma by a margin of over 3 lakh votes. Waise bhi sarey rapists.. chor..terrorists. fraudsters..criminals inki hi jamat k hai..